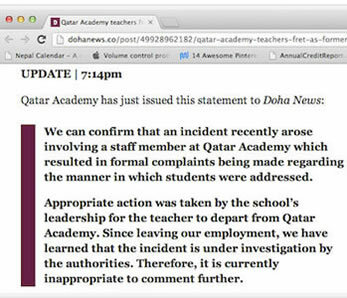 If you’ve been following Dorje Gurung’s experience at Qatar Academy, you know he was allegedly misquoted by a twelve-year-old student and later accused by the boy’s father of insulting Islam. 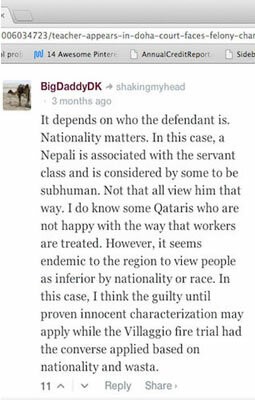 Dorje was subsequently jailed in Qatari to face trial. The following is Dorje’s account of his time spent in jail–his thoughts, emotions and realizations. If not for the support he received from people around the globe concerned with justice in this matter, Dorje may well have been sentenced to the full 5-7 years, a conviction based strictly on the word of a child. We at ISR continually stress the need for international educators to thoroughly research international schools when considering a future career move. Based on similar incidences to that of Dorje, it has become ever more evident that job seekers must take the time to research and understand the degree of support a school offers its teachers, if any, should they find themselves unexpectedly entangled in legal disputes. Lying on the filthy bed the afternoon of May 1, sleep would have been the best escape. But, of course, the last thing that would come. I had lost my job. I had lost thousands of dollars. I had lost my health insurance. As far as I knew, I had lost support from my employer–I didn’t have a single visit from them in the hours I spent at the police station. And now, having lost my freedom, there was a chance that I could lose everything else that mattered: my family and my sanity! If my family knew where I was, I knew they would be devastated. In my parents’ case, I feared, probably even worse. A huge dissonance lay between where I was supposed to be and where I was. I was supposed to be in my apartment, sharing a few drinks with my friends, saying my good-byes, in preparation for my departure for Nepal (in two days). Instead, there I was in a private cell. I knew my sanity could be the next casualty. The repetitive question,”How did it come to this?! How did it come to this? !” ringing through my head again and again was maddening. I had no idea how long I would be in this room. I tried to imagine a worse nightmare…I couldn’t. My challenge, my sanity, lay in closing the gap between where I thought I was supposed to be and where I was. On the verge of losing everything–EVERYTHING–it was no surprise then that I would lose sleep! Helping me to lose my sleep was my new-found neighbor in the private cell next door. He had already partly lost his head! All night, the Pakistani man kept me awake with his intermittent loud screams, groans, mumbling and furniture banging! In the days that followed however, life, in a strange way, turned prison-normal! Returning from the Public Prosecution office, the following day, I ended up in a cell in the midst of about a dozen other Nepalese inmates. Thankfully it turned out, I wasn’t required to return to my private cell. I spent the rest of my time with ten other Nepalese. Days inside consisted of three meals, fruit and yogurt for snacks, Hindi (Bollywood) movies and WWF wrestling on TV and games of chess. After the fourth day, I spent most of my time reading novels my friends had dropped off. Reading provided the escape, the distraction my mind needed. My cell mates kept assuring me of how, because I had so many foreign friends, I would be freed in no time, unlike them. I resisted the temptation to ask, “Why not a Nepali interpreter then?” being aware of how I would struggle. The exchanges I had with the final prosecutor was essentially a repeat of the ones I had had with the police officers the previous day. The second trip to the Public Prosecution office, Sunday, May 5, I faced a prosecutor who spoke English. Again we had the same exchanges I had had the previous visit but with one important difference. So I did, but they took me right back to jail! The proceedings in the court Thursday, May 9, again was nothing but another kangaroo court. Neither did the judge speak English nor was there an interpreter. No questioning, no witnesses, no arguments…nothing. At no time was I informed of any rights I might have had. Not unlike at the Public Prosecutor’s office, I had no representation there either. I was given two weeks before my next court appearance. In spite of being told by SMS on May 1 that a Qatar Foundation legal department representative and an HSSE representative were coming, they showed up neither at the police station, nor in jail, nor at the Prosecutor’s office, nor at the court at any time. Far from feeling supported, I felt I had been dealt yet another blow by my employer when I read Qatar Academy’s statement in the first Doha News article (see Figure 2 below), more than a week after my incarceration. The statement told me I was no longer their concern. Additionally, no one from the Nepalese Embassy made any contact. Forget about me. No embassy representative had set foot in either the jail or the judicial offices to meet or visit ANY Nepalese prisoners. Two of the prisoners I shared my cell with had been there for over two and a half years. They told me they had yet to see a single representative from the diplomatic mission. (One of them had even written to the embassy and to at least a Nepalese journalist each in both Kathmandu and Doha.) The closest thing to the mission’s involvement in my case was to make a lame statement, also more than a week into my incarceration, to Doha News saying, and I quote, “[I]nvestigation into Gurung’s case ‘will take time’.” My friends however were a different story! They came to see me, regularly, even on days they weren’t allowed. (Visiting hours were limited to just Sunday afternoons.) A number of them came both Sundays, May 5 as well as May 12. On other days they dropped off care packages containing books, snacks, change of clothes and Mueslix. They came to the Public Prosecutor’s office and they came to the court as well. All of which, of course, helped maintain my sanity. But the most crucial contribution my friends in Doha made was to defy the gag order from the school (see Figure 3 below), at great risk to their own jobs, etc. They shared my story with Shabina Khatri, a journalist for Doha News. Following my return to jail after my court appearance, unbeknownst to me, my friends around the world had picked up that as well as the story about my appearance in court the following day, and had begun a campaign for my release. Following my arraignment, the afternoon and evening of May 9, I had my first telephone conversation with a few friends in Doha. I don’t recall any of them mentioning anything about the campaign. Maybe because it hadn’t really picked up or even begun. Regardless, apart from the first Doha News article, I was completely in the dark about everything else to do with the frantic activities taking place literally all over the world. In the mean time, I had been racking my brains for a way to tell my international friends about my situation without alarming my family. One option I considered was getting a friend to publicize it through my Facebook page. But concerned about my parents finding out, I had been working on a systematic and efficient way of unfriending all my friends with connections to them. I got as far as passing my login details to a friend. I was confidant that once my friends around the world found out, they would start some campaign. However, that it would be so big I could not have guessed! It had gotten so big in just four days, as a matter of fact, it secured my freedom! The afternoon of Sunday, May 12, I walked into the reception area of the police station–to the complete astonishment of my friends waiting to see me inside–a free man, but still unsure and suspicious. The Arab-speaking Qatar Academy staff was also there. The parent had apparently dropped the charges, according to this staff. But his dismissiveness and the flippant manner in which he told me, made it difficult for me to believe him. Besides, the police didn’t have the necessary release papers. I would have to return the following morning for them. I found everything that happened in the police station, before I was allowed to walk out, a little surreal. I signed two papers with some Arabic texts on them. The Arab-speaking QA staff explained that the signatures were to confirm that I would not “engage in such activities if I returned to Qatar in the future.” I had not even expected to be released. Even if released, I had absolutely no plans to return to Qatar. Additionally, I was among friends outside. What’s more, they were telling me I had no idea what had been happening around the world. Not much of what my friends were telling me about the campaign sank in–I don’t remember much of those conversations–and I wasn’t sure what was going on. The Principal and the Vice-principal also came to congratulate me on my release. The Principal informed me how I needed to thank the Vice-principal for his work with the parent getting him to drop the charges. What they were unaware of was that I had already had long-distance phone conversations with two friends heavily involved in the campaign. Thousands of friends, colleagues, classmates, former colleagues, former teachers, former students, friends of friends and other well-wishers had spent hours on the campaign. A number of them had spent sleepless nights running and coordinating the campaign. By this time, I had already grown suspicious of the “official” reason for my release. That afternoon there were concerns for my safety and security. My friends and the Nepalese Embassy made arrangements for a secure accommodation for my last night in Doha. It wasn’t, therefore, until after 36 hours of my release, until I was safe and secure in Kathmandu, Nepal, far away from Qatar, that I was able to make my first public statement. All that because of a 12-year old’s words to his father about an exchange we had in the cafeteria. Some additional adults were also indirectly involved in the ordeal. When their numbers are added up–the parent, the four administrators and the seven Board of Governors of Qatar Academy–oddly, you also get 12! The numbers associated with the ordeal therefore should actually be the following: 12121212–12-year old, 12 adults, 12 days and 12th of May. Even after all that, after everything had been said and done, I have gotten confirmation that the charges have still NOT been dropped! Today, Dorje is safely back in his home country of Nepal, intently focused on creating a school to provide high quality education to children in rural areas of Nepal. You can learn more about this project Start Something Good. Please note: The donation feature at the Start Something Good web page has temporarily expired. A new donation feature will be coming soon. If you would like to help support Dorje’s project, stay tuned…we’ll let you know when the donation feature is available again. In the meantime, you can visit Start Something Good to learn all about this project.